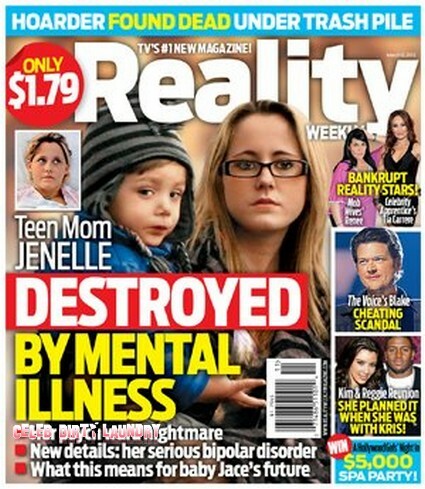 The March 12th, 2012 issue of Reality Weekly features the cover story ‘Teen Mom Jenelle – Destroyed by Mental Illness.’ The magazine claims that Teen Mom Jenelle Evans had a psych ward nightmare and they have all the news about her serious bipolar disorder. They go on to speculate on what this this means for Her son Jace’s future. Meanwhile this week Jenelle posted intimate photos of herself and new beau Gary Head on Facebook. In the pictures Jenelle and Gary appeared to in her bedroom together in suggestive poses and they are certainly inappropriate to have posted. Jenelle needs to get her act together. Also featured in this week’s magazine – Bankrupt reality stars including Mob Wives star Renee Graziano & Celebrity Apprentice‘s Tia Carrere. Did Kim Kardashian plan her reunion with Reggie Bush while married to Kris Humphries? To find out all this and more, pick up the current issue of Reality Weekly.